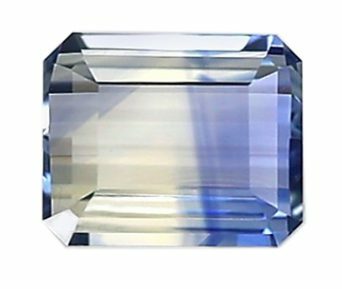 Most people will never see the unique beauty of a bi-color sapphire in their lifetime, they are so rare and highly collectible. An emerald cut bi-color sapphire with beautiful clarity. 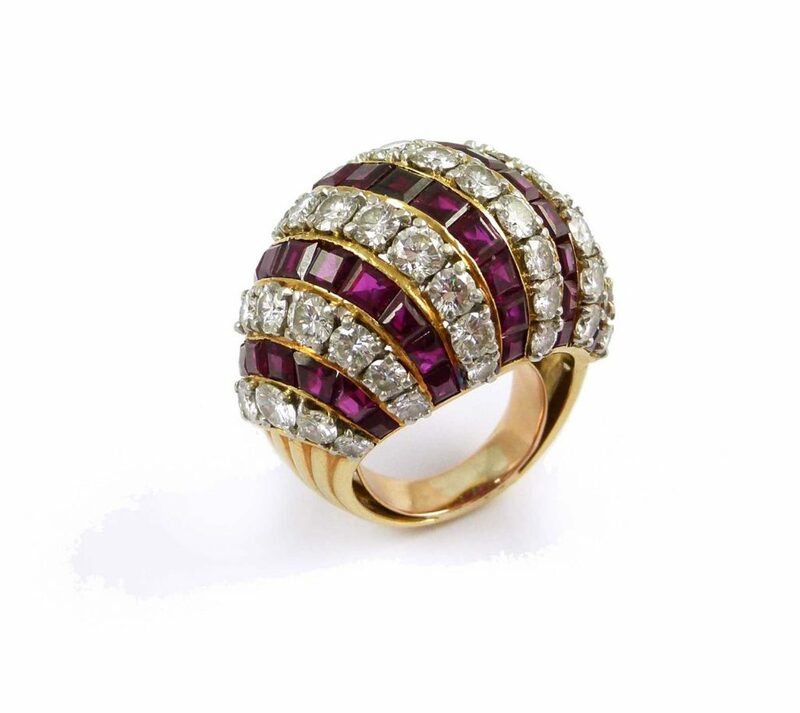 Exceptionally rare stones, bi-color sapphires are stones that contain two colors as a result of color zoning . They have two colors that are obvious to the naked eye and do not change under different lighting conditions. The range can sway from very dramatic in its color zoning, and displaying two very different colors present in the stone, to very slight color zoning that shows two very similar, but still different, colors in one stone. 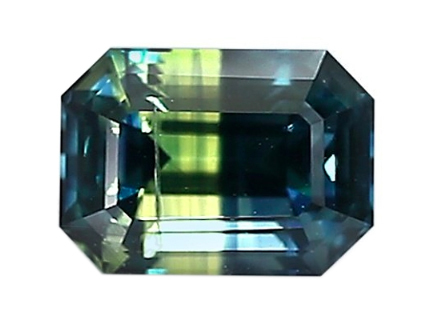 A truly special Ceylon emerald cut bi-color sapphire. 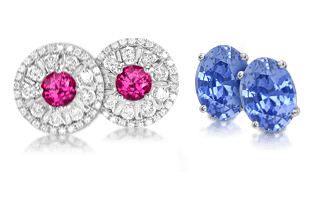 The color zoning in bi-color sapphires will range from minor to prominent. The desirability of the stone is based on the location of the colors, as well as the difference and contrast in color. The most desirable bi-color zoning appears as gradual, starting with one color and ending with another complementary hue . Color zoning is always judged from the face up position, looking down through the table of the stone. 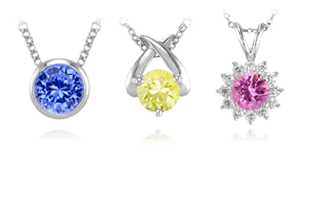 Bi-color sapphires can be cut into many different shapes, no different from standard color sapphires. They are usually smaller in size, and because rough is rare, they are cut to preserve their most beautiful attributes. 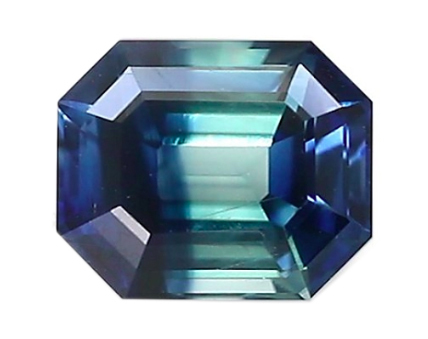 An emerald cut bi-color Nigerian sapphire. Large examples of these stones are very difficult to come by as well as stones that are eye-clean . Clarity is much more likely to be slightly or very slightly included. These sapphires come from a variety of locations, but the regions producing the most valuable and beautiful are Ceylon, Madagascar, Tanzania, Nigeria, and Thailand. 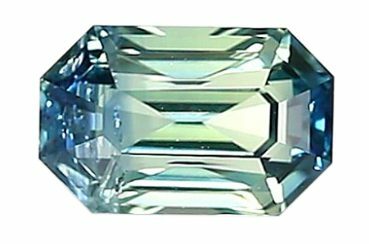 A lovely Nigerian emerald cut bi-color sapphire. Of all the rare colors that sapphires are found, how fascinating is it to have two or more colors in a single sapphire stone? These bi-color sapphires (and multi-colors too!) 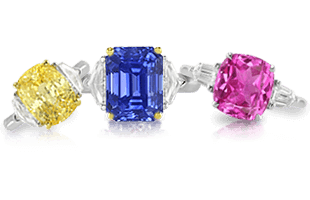 are extraordinarily rare, totally impossible to find two of the same, and are a true collector’s gemstone. I have many that I keep in my private collection marked ‘not for sale’ on the storage container. I encourage readers to consider these unique creations of mother nature as some of the best value deals in our collection. If you want a true one-of-a-kind, a bi-color is it! 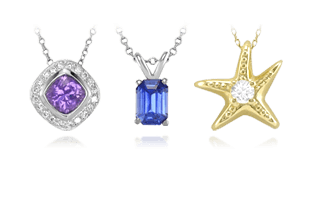 Follow with us next as we continue delving into the unique and rare sapphire colors with the world of Purple & Violet Sapphires.